On the subject of how stinky the world was back in the nineteenth century, let’s talk a little bit about hair. If you’ve ever gone for weeks without shampooing, especially if you have long hair, you know that unwashed hair smells. 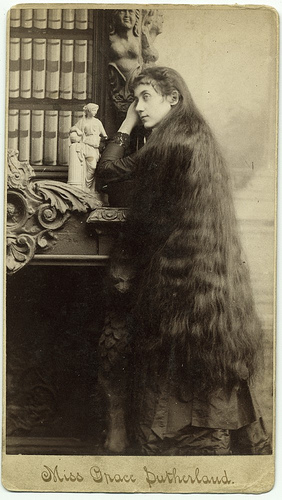 Modern shampoo wasn’t invented until the 1920’s. So what did a girl do to keep her hair fresh looking and sweet smelling? First of all, they didn’t wash their hair all that often. One etiquette book recommended every 2-3 weeks, another source said seasonal, still another said every couple of months. You get the idea – it certainly wasn’t every day in the shower like we do today. Back then, washing hair was a big production. Everybody wore their hair long; there was no running water, hot or cold and no hair dryers. What did they use to wash their hair? There were commercially available shampoos. A check of the Montgomery Ward Catalogue from 1895 shows two products: Graham’s Shampoo Paste at 18 cents a box and Shampoo Powder or “Seafoam” selling for 25 cents a box. However, most of the time, homemade concoctions were the shampoos of choice. A recipe from 1893 noted by Baroness Staffe in “The Ladies Dressing Room” shows the following mixture: quart of hot or cold water, 1 oz. carbonate of soda, ½ oz. Pear’s soap cut into small pieces, a few drops of perfume essence and 1 oz. spirit of wine. Other mixtures included bicarbonate of soda or salted rainwater. Lemon juice, herbal mixtures and even beer were used as rinses. The Victorian ladies had other maneuvers between washings. Daily brushing, the proverbial 100 strokes, with a clean brush removed oils and dirt. Brushing a powder like soda through the hair had a similar effect. Still, you have to wonder how effective these were. And if it really mattered. After all, no respectable unmarried young woman would let a man get close enough to get a whiff of her hair, would she?